Product prices and availability are accurate as of 2019-04-19 03:48:21 UTC and are subject to change. Any price and availability information displayed on http://www.amazon.com/ at the time of purchase will apply to the purchase of this product. 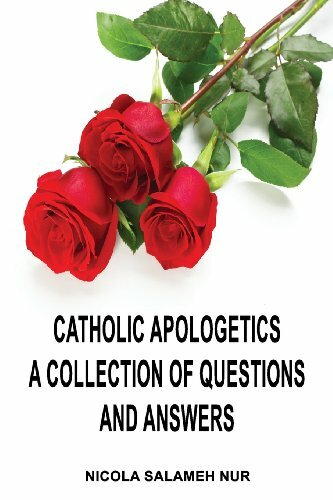 Author Bookstand is proud to offer Catholic Apologetics: A Collection of Questions and Answers by Bookstand Publishing. Bookstand Publishing offers books by the best indie authors throughout North America and the world. Bookstand Publishing is dedicated to offering original content to a broad audience and promoting great authors, literacy, and freedom of expression. Catholic Apologetics: A Collection of Questions and Answers has generated a lot of interest and excitement and we think it would be an excellent addition to your library. This Catholic apologetics book is written in a contemporary style of questions and answers. It is written for the 'gathered and the scattered' of God's people. It is a devotional, inspirational and intensely personal book. It is meant to evangelize, defend, inspire, strengthen, console and heal Christians in general and Catholics in particular. It is written by a lay Catholic man in response to the materialistic relativistic challenges of our modern day. One can see within and between the lines of this book the intense love and adoration the author displays towards Jesus in the Eucharist. A quick glance at the table of contents shows the type of issues discussed. 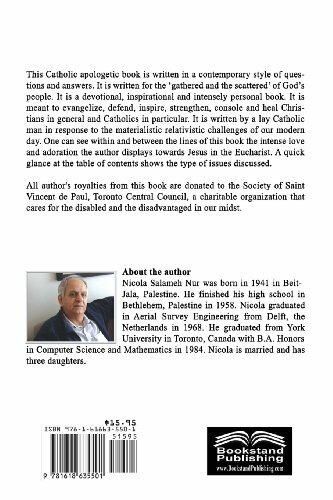 All author's royalties from this book are donated to the Society of Saint Vincent de Paul, Toronto Central Council, a charitable organization that cares for the disabled and the disadvantaged in our midst.